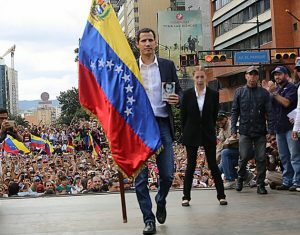 STOCKHOLM, Mar 21 2019 – More than 60 countries have recognized Juan Guaidó as legitimate interim president. But among international trade unions, support for Venezuelan self-determination is resolute. On January 23, the leader of the National Assembly, Juan Guaidó, declared himself interim president of Venezuela. His claim on the presidency was immediately recognized by the United States who, through Secretary of State Mike Pompeo, called for the world to “pick a side”. A little over 60 countries have followed in the footsteps of the United States, according to information from Al Jazeera. On February 4, Sweden joined the list. “Sweden supports and acknowledges Juan Guaidó as the leader of the National Assembly and, in accordance with the country’s constitution, his attempts to serve as interim President of Venezuela, now responsible for making sure free and fair democratic elections will be called,” said Margot Wallström, Minister for Foreign Affairs, in a statement that stressed the importance of solving the crisis peacefully. TUCA is calling upon the government of Venezuela and the opposition to seek out dialogue, and for the international community to support this, but also states that the support for Guaidó “is a grave act of interference and intervention in the internal affairs of a sovereign country, setting back the region to times we thought belonged to the past, in which coups d’état and military dictatorships were instigated”. Many national trade union confederations have taken the same position. South Africa’s largest confederations Cosatu and Saftu condemn what they both call a “coup attempt”. Trade unions in Canada are protesting the government’s decision to recognize Guaidó. The trade union confederation CLC writes that it supports “the Venezuelan people’s right to peaceful self-determination”. The election result was recognised by some countries, including China, South Africa, Cuba, Iran, Syria, and Turkey. The country’s largest trade union, the Canadian Union of Public Employees, states that Canada “has chosen to side with Donald Trump and US foreign policy”, while the Canadian Union of Postal Workers calls the Canadian standpoint “deeply disturbing” and “ in direct violation of international law”. The global union IndustriALL condemns the acknowledgement of Guaidó and “also rejects the external boycott, which has clear political and economic motives that violate Venezuela’s sovereignty”. “Concerning the Presidency of Venezuela, that is a matter for the people of Venezuela to decide, not any other entity outside of the country,” says Director of Communications Tim Noonan to Arbetet Global. The ITUC also refers to its statement on Venezuela, which was adopted by the organisation’s world congress in December last year, before Guaidó’s challenge. The Swedish Trade Union Confederation, LO, is in favour of humanitarian aid and UN led reconcilliation efforts. The international department stresses that the LO does not take sides in the question of the presidency, but does take a swing at foreign involvement.